Scuba diving is a great way to view the amazing world under the ocean. With the wide availability of scuba shops, diving schools, and instructors, even a beginner can enjoy the thrill of diving. 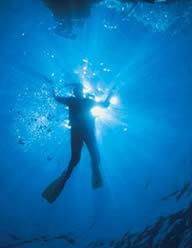 Look for a school and scuba shops where there are four students or less per instructors. This ensures that you will get the instructor's full attention and is much safer in case there is an emergency situation in the water. If you are a novice, hold off on purchasing your own scuba diving gear from nearby scuba shops until you are comfortable with the process and know what you will need from your equipment. Most scuba shops will also rent equipment, so this may be a more economical choice if you only plan to dive a few times per year. You will need basic scuba diving gear such as a scuba mask, wetsuit, swim fins, and all the equipment associated with the oxygen tank system. In addition to the tank itself, a regulator is necessary to convert the compressed air into a form that can be breathed in. Buoyancy compensators and cylinder belts are used to help the scuba diver adjust his or her position in the water.